Photos taken from left to Right Makao Usui, Chujiro Hayashi, Mrs. Hawayo Takata. Takata photo taken June 11, 1979, Penticton, BC, Canada. Used with permission from the estate of Gunter and Ursula Baylow. 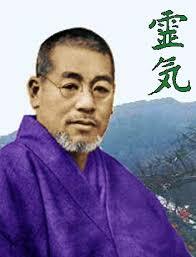 Dr. Makao Usui is the founder of the Reiki System of Healing, he was born in Japan in 1865. In 1914, he spent extensive time on Mt. Kurama – it is there on a 21 day meditation & fasting retreat that the Reiki energy came to him in a profound way and was spiritually awakened. He did not take long to realize this gift and used his new healing ability to help others. For the next seven years Usui-Sensei worked with the poor people of Kyoto. He was known to be a very humble, compassionate, generous and loving human being. In 1922, he moved to Tokyo and started a healing society which he named Usui Reiki Ryoho Gakki, which means “The Usui Systeim of Reiki Healing.” He also opened a Reiki clinic in Harajuku, Aoyama, Tokyo. There he taught classes and gave treatments. Eventually one of his students, Mr. J Ushida trained Dr. Churjiro Hayashi (top center picture) who also became a master teacher and opened a school and clinic in Tokyo. It was to this clinic that Mrs. Takata (top right picture) was directed in 1935. Mrs. Takata travelled all the way from Hawaii to Tokyo as she was very sick with several ailments: a tumor, gallstones, appendicitis and severe asthma, as well, she had a nervous breakdown. Upon arrival at Hayashi’s clinic, she began receiving treatments. Two Reiki practitioners would treat her each day. The heat from their hands was so strong, she said, that she thought they were secretly using some kind of equipment. Mrs. Takata got progressively better and in four months was completely healed. She wanted to learn Reiki for herself. In the spring of 1936 she received First Degree Reiki from Dr. Hayashi. She then worked with him for a year and received Second Degree Reiki. Mrs. Takata returned to Hawaii in 1937, followed shortly thereafter by Dr. Hayashi and his daughter who came to help establish Reiki there. In February of 1938 Dr. Hayashi initiated Hawayo Takata as a Reiki Master. Mrs. Takata practiced Reiki and established several clinics in Hawaii. She gave treatments and initiated students up to Reiki II. She became a well known healer and traveled to the US mainland and other parts of the world teaching and giving treatments. She was a powerful healer who attributed her success to the fact that she did so much Reiki on each client. It was not until 1970 that Mrs. Takata began initiating Reiki Masters. (there is much more to this part of the story in the long version). Before Mrs. Takata made her transition on December 11, 1980, she had initiated 22 Reiki Masters. These 22 Masters began teaching others. In the mid-1980’s after Mrs. Takata had passed on, Iris Ishikura, one of Takata’s Masters began charging a more reasonable fee for the Master Level training (it is important to note that Mrs. Takata charged very high fees for the Reiki training and there were many other rules as you will read in the long version). Because of this many more Masters were trained, the training evolved quite quickly after this, workbooks were created, notes and tapes were allowed, and many began studying with more than one teacher – as they were not allowed before. At this time, Reiki began to grow very quickly and spread all over the world. There are at least 200,000 Reiki Masters in the world today with well over 1,000,000 practitioners, and the numbers continue to grow! In 1988 William Lee Rand founded the “Center for Spiritual Development”. (a detailed history of his training is in the long version at their site ICRT In 1991 the name was changed to the “Center for Reiki Training” as Reiki became the only focus. In 1997, because of all the classes that were being taught abroad, “International” was added to the name. I must emphasize that the History of Reiki is much more in-depth and the whole story can be read at the ICRT as well as in the First and Second Degree Manual “Reiki The Healing Touch” by William Lee Rand (this book is included with Level 1 & 2). I think it is important to share my History of Reiki as well. I have spent the past 27 years on a journey of healing and self-discovery. As you know there are so many stepping stones to recovery and healing, and finding Reiki has been a major stepping stone for positive healing for me. I have received diplomas in Level 1, 2, ART (Advanced Reiki Training) and Master’s Level Reiki – and I am proud to be a member of the CRA (Canadian Reiki Association) Member # CRA 13-312. In Feb/2015 I received my Holy Fire Karuna Masters Level Certification at the ICRT (International Center of Reiki Training) in Maui, Hawaii to study with William Rand/Founder. Since then, giving and receiving Reiki becomes richer and deeper, leading me more into the “Great Mystery” of profound awe & healing.